Thomas of Effingham, Master of Defense, Baron of Carolingia, and sometimes Deadpool. The overall structure of the day will consist of the perennial favorite of round robin pools followed by a 16 person double elimination tournament, followed by a set of finals with rotating weapons. For tournament conventions and details for each part, read on! * This tournament is heavy rapier default. Light rapier may not be used. C&T may not be used. * All double kills are to be refought until a clear victor is found. * Two handed swords may not be used in conjunction with secondary items. * Barring safety issues, there will be no recentering. If you are on the ropes or in a corner, we expect that you wanted to be there or have been placed there by your opponent and you will need to deal with that. * Holds will not be called if you reach the ropes. If you cross them, tangle in them, or otherwise create a hazard, a hold will be called and you will be placed on the rope for the bout to continue. * If you are on the ropes and continually creating a safety issue or causing repeated holds by stepping out, marshals can be expected to take action based on that. * Bring your best form. * Fights are one and done. * If there are ties to determine who advances, we’ll initially resolve them by who beat who. In other words, if two fencers are tied for second but one beat the other in the pool, that fencer will advance. If that doesn’t work due to some strange edge-case math, we’ll have fightoffs to advance. Those fighters who remain undefeated should display their prowess with single rapier. Should you take a loss, you may fight with whatever you see fit. Each pairing will be determined by the best of three passes. The bouts fought among the final four combatants may be fought with whatever forms the combatants wish. When an undefeated fighter is paired against a fighter with a single loss, the latter needs two wins – that is, they must win two matches, each best two of three passes – to advance. The undefeated fighter needs to win a single best two of three match. A coin toss will determine which fencer calls their form for the initial bout first. 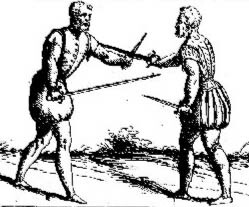 Forms that can be chosen by combatants consist of Single Rapier, Rapier and Dagger, Case of Rapier, Rapier and Rigid Parry,Rapier and Non-Rigid Parry, and Two-handed Sword. Double kills are refought for a clean result. Please parry. The Gazette thanks the MoLs, marshals, and heralds for assisting in reporting. Any mistakes are the fault of The Gazette alone. Pennsic Rapier Champs Team Announced! ≈ Comments Off on Pennsic Rapier Champs Team Announced! At court at the Great Northeast War, Maréchal Remy Delamontagne de Gascogne, Rapier General for the East Kingdom, announced the EK Pennsic Rapier Champions teams. He was joined by Don Lupold Hass to name the Heroic Champs and Master Nataliia Anastasiia Evgenova Sviatoslavina to name the Melee Champs. Champions were selected through a series of qualifying tournaments and group practices to hone their skills and display their prowess and comportment. Traduction de cet article: https://eastkingdomgazette.org/2017/12/16/east-kingdom-rapier-champs-rules-and-pools/ préparé par Maîtresse A’isha bint Jamil avec l’aide de Google. Here is the news we have promised and you have all waited with such grace and patience. We have searched high and low throughout this vast kingdom for a gentle to lead our fencers into war. We are pleased to announce that we have found what we have sought. Pennsic is going to be fast approaching and it’s time to start assembling the East’s finest blades for the Champ’s teams. I’ll be coordinating and captaining the Melee Champ Team once again this year, and I’m looking for fencers with the skill, comportment and character to represent our kingdom. If you are interested in being on the Melee Champ’s team this year, please fire me an email at Justin.Aucoin@gmail.com so I can add you to my list of candidates. Important: I want to make it clear that I want to hear from anyone who’s interested in the melee champs team. It doesn’t matter if you’re a Master of Defense, just got your AoA, or just got authorized two minutes ago. What I care about is that you have the passion and will to represent your kingdom. Once I hear from folks I’ll compile the long list of candidates and will get in touch with them on when/where we’ll work together to get ready for the war point. Barring some sort of catastrophe, the Pennsic Melee Champs team will be chosen from this list, so if you want to represent the East, let me know. Also of note: You can throw your hat in the ring for the melee team and also try to fight your way in for the Pennsic single’s champ team. I have zero issue with that and encourage it. Please forward this notice to your local fencing practices. I don’t want anyone who might be interested on making the team miss out. If you have any questions or concerns, don’t hesitate to get in touch with me. Last night, we were pleased to accept a bid for Rapier Champions on October 10th in the Barony of Smoking Rocks (New Bedford, MA). A formal event posting will be shortly forthcoming, but we wanted to inform those interested in attending as soon as possible. We look forward to a day of skill, chivalrous combat, and the pageantry of rapier in the East. En français Traduction par Boyarinia Ekaterina Solov’eva Pevtsova. Salutation aux escrimeurs de l’Est. Hier soir, nous avons eu le plaisir d’accepter l’offre pour le championnat d’escrime, qui se tiendra le 10 octobre dans la Baronie de Smoking Rocks (New Bedford, MA). Une annonce formelle arrivera sous peu mais nous voulions en informer le plus rapidement possible ceux qui désirent s’y presenter. Nous avons hâte de vos l’habileté, l’honneur et la virtuosité des escrimeurs du Royaume de l’Est. Lord Thomas of Effingham was chosen by Her Majesty Avelina as her Queen’s Champion of Fence. Don Donovan Shinnock won the tournament and the title of King’s Champion of Fence. 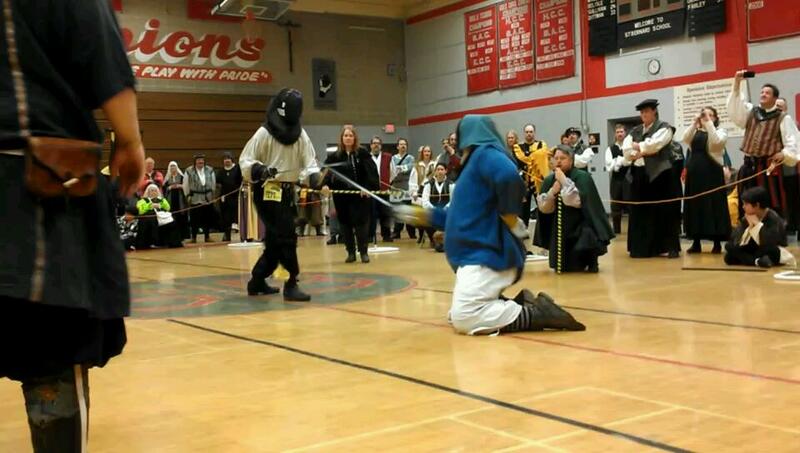 The finals between Lord Lucien de Wyntere and Don Donovan Shinnock were decided from the best of 5 bouts. The match went all 5 bouts, with Donovan taking the first, Lucien the next two, and Donovan the last 2. Each round was a different, matched weapons form. The Gazette thanks Raziya Bint Rusa, Martyn de Halliwell, and Tola knityr for updates and photos throughout the day. Countess Marguerite ingen Lachlainn has been kind enough to send us the following report from King’s and Queen’s Rapier Champions, currently being fought in snowy L’ile du Dragon Dormant.